Somehow we ended up in the wrong movie today, can someone please change it back to the positive, energetic, funny one? Our day started early, we had to pack the car, buy diesel and food, and be at the border before 09:00. At the gas station the guy didn’t want to fill our extra tanks, and my nerves were so tense I smashed a tank on the car. Fortunately Helena had more patience and we got our diesel. We read that in Uzbekistan fuel is scarce and want to take no risks since we only got three days in the country with a transit visa, and have to drive approx. 1.300 km, more then the autonomy of the Range Rover incl. tanks. We paid the hefty fine, promising to file a complaint with the authorities. But then we were put into a room and asked to write a “confession” on a piece of paper or face bureaucratic problems and loose more time. Also, we wouldn’t get a copy of the documents they wanted us to sign. It was already 11:30, delays would have meant one more lost day, more “straf”, more “stress”. We called the embassy again. Finally a civilian immigration officer showed up and we closed the matter. 12:00. After immigration came customs, we had to take every single item out of the car again, check the car, re-pack. This tip is testing our limits of patience, of zen moments, of keeping your cool when all you want is leave, but you can’t. At 13:00 we left Turkmenistan, with a heartfelt “f**k off” sent back to the border guys as we drove to the Uzbek checkpoint. More paperwork, more questions, we had to count every single bill of foreign currency and declare it. Strangely our car didn’t get checked. After almost 2h of waiting we were starving and went to the car to eat something. Suddenly one of the border officials came to us, handed us our documents and wished us a good time in Uzbekistan. We looked at each other in complete astonishment. Where was the trick? What was the next check? But there was no trick, at 15:00 we left the border and drove into Uzbekistan. Expecting police controls right after the border we drove slowly towards Khiva, through flat countryside and ramshackle villages. Uzbekistan has approx 1/8 of GDP per head of already desolate Turkmenistan, and you see it immediately. If Turkmenistan is Toyota land, Uzbekistan is Daewoo land, the Matiz and a microscopic bus are the preferred models. Houses are made of either soviet concrete or mud. Roads were better though, and after 1h we reached Khiva, an Unesco listed site. At the border we had chatted with a guy from the UK embassy in Ashgabat, that had told is that the better monuments are in Uzbekistan. 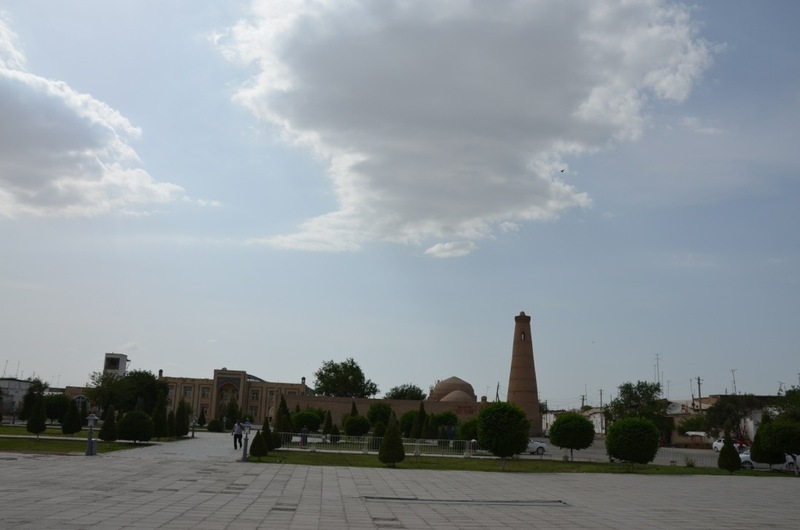 He said something like “you can actually see how it was and don’t have to imagine it all the time.” So we were quite eager to visit this place, even if in a hurry, since we had to drive 550 km to Bukhara today. 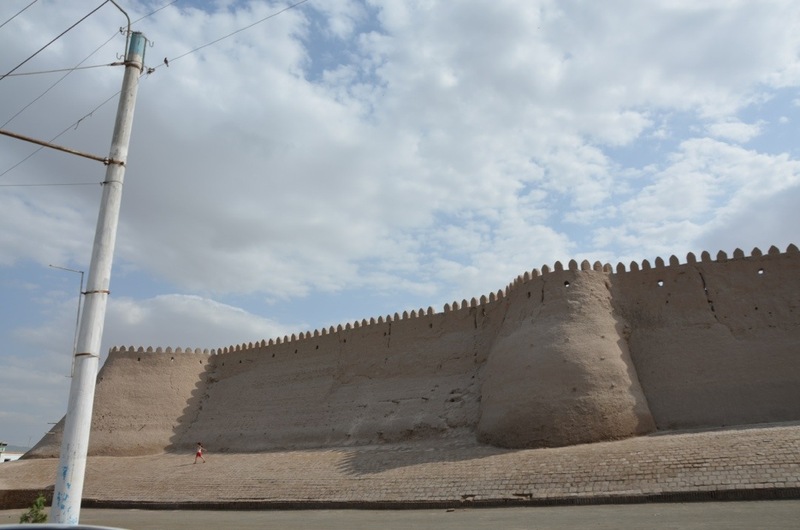 Arrived in Khiva town, we drove around 20 minutes trying to find the old town. Not a sign on the road, and the locals gave vague answers to our questions about directions. When we finally found it and parked the car, we were greeted with the usual “hotel?” and “where are you from?”. Still furious and exhausted from the 6h at the borders we ignored them and entered the old city, that is indeed in much better shape then any place we have seen in Turkmenistan. After a few meters a girl came to us explaining us we had to buy an entry ticket and pay for taking pictures. 27 USD! I freaked out. The LP guide said we could visit the city for free and entry would cost 7,50 each. OK that prices go up over time, but 27 dollars for half an hour of strolling through this place was crazy, so we left even more furious, frustrated. Sometimes these countries seem like destinations for masochist tourists. We spent one hour trying to find the main road to Bukhara. No road signs at all and erratic road design so that we couldn’t identify the main roads. It was getting late, we were wasting diesel, and our mood reached a low point. Today was not our day. We eventually found the road, but it was very Armenian, full of potholes. If it hadn’t gotten better after some km I think I would have stopped and camped in the desert today. But fortunately the Uzbeks invest in their infrastructure and are building a super highway across the desert, and a big part of it is already in use. It’s a concrete highway, but brand new. We reached up to 160km/h. Still, as it got dark the old road came back, and we had to drive 2h from one pothole to the next. We arrived at what seemed to be Bukhara at 22:45, again no road signs and little light on the streets. After 30 mins of driving around we found some landmarks that were on our map. But no chance to reach the hotel we had booked. We waited 20 mins for the guy we called from the hotel to pick us up, but he didn’t show up. Finally a taxi driver led is into what seemed to be a slum, on dirt roads, but apparently is the old town. Shortly after midnight we found the hotel finally. And after a wasted, horrible day, we have found an oasis that will make tomorrow start much better.